Rep. Louie Gohmert (R-Texas) speaks as Rep. Mark Meadows (R-NC) (R), Rep. Jim Jordan (R-OH) (2nd R), and Rep. Matt Gaetz (R-FL) (L) listen during a news conference May 22, 2018 on Capitol Hill in Washington, D.C. The sexual-assault apologists just keep on coming out of the GOP woodwork. On Monday, Rep. Louie Gohmert defended his Republican brethren Jim Jordan of Ohio against allegations that he knew about reported abuse during his time as a wrestling coach at Ohio State University and did nothing to stop it. Gohmert also criticized Perkins Coie, the law firm hired by Ohio State University to investigate the matter. 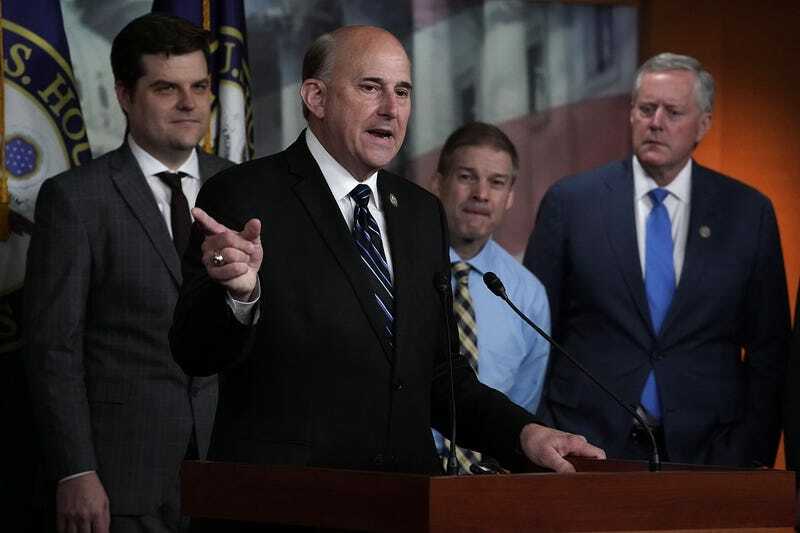 Gohmert said the accusers found “willing and very expensive assistance of Perkins Coie, a Washington, D.C.-based dirty tricks law firm,” although the firm doesn’t represent any of the men who claim to have been abused. So if we are reading this correctly, Gohmert has connected the law firm to the DNC and Hillary Clinton, and insinuates that there is some deep-seated conspiracy afoot despite the firm being hired by the university to conduct an independent investigation. But Gohmert wasn’t finished; he also noted that the doctor who reportedly assaulted the wrestlers is dead so what’s the big deal? “So this isn’t even about prosecuting him,” he said. He ended the statement by confirming that he too, like the president of the United States, believes Jim Jordan. I would say that this is shocking and disheartening but, this is [Trump’s] America (Childish Gambino voice).